I'm not an expert on Buenos Aires, but I have been a tourist in BA a few times now. Julia wrote a series of posts about her trip with a lot of helpful info. I thought I might also post my list of favorites. When you're in La Boca, it's worth it to visit La Boca's Fine Arts Museum "Benito Quinquela Martin" museum (the views from the rooftop garden are great) and it's the studio of one of Argentina's most famous artists. 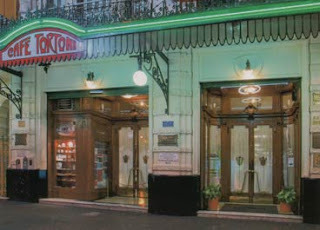 Cafe Tortoni for churros and a cortado (coffee) or a submarino (hot chocolate). Filo for gourmet pizzas and delicious pasta. We eat here every trip. El Cuartito for more pizza, of course! This is a classic restaurant and you really must try it - photo courtesy of Julia. Buenos Tours has many great posts on off-the-beaten-path places to visit. In case you're learning Spanish - There's a podcast called Coffeebreak Spanish and the first 30 episodes focus on the phrases that you need for tourist travel. There are different cuts of beef: If a la parilla (on the grill) you can get these cuts for steak - vacio, entrecot - or you can get ribs (costilla). Other cuts/types of meat come in small bites in picadas, along with cheeses, peanuts and such. You could also order lomo, which is a medallion of meat that you can get with different sauces, and it usually comes as a dish with potatoes - or you could get a lomo sandwich, which is flattened meat. There are also milanesas which are very thin steaks, breaded and fried. You can get these as pollo or carne and they're great with fries (says gui). When ordering pasta, you pick the type of pasta and also the type of sauce (salsa), sold separately. So you could get noquis or tallarines (spaghetti) with salsa rosa/tuco (tomato sauce), crema (seriously just cream, not alfredo), mixta (a combo of both), or bolognesa, etc. Ensaladas don't always come with lettuce (lechuga) but it's yummy to get a carrot, beet, corn salad or something like that. Agua sin gas typically comes in bottles, instead of being just tap water.